Explore Japan’s enchanting/fascinating Mt. Fuji region on this full-day trip from Tokyo with a tour conductor. Observe Mt. Fuji from the privileged point of view of the popular Fujinomiya trails’ 5th station, then walk Japan’s longest suspended bridge Mishima SKYWALK for a 360 degrees panorama of Japan’s most famous peak, together with Mt.Izu and Suruga Bay. Finally, ride one of Japan’s oldest mountain trains on the Hakone Tozan Railway and enjoy the breath-taking landscape of the surrounding Fuji-Hakone-Izu National Park from its windows. An all-you-can-eat lunch of seafood is also included in this tour: choose your favorite among shrimps, turban shells, scallops etc. and grill it by yourself at your table! Spend the whole day among the most monumental/imposing mountains near Tokyo, and enjoy a delicious all-you-can eat seafood lunch in-between stops. The tour starts from Shinjuku and takes you to Fujinomiya 5th station, one of the most popular stops on the way to the top of Mt.Fuji. There, you have 40 minutes to stroll around and appreciate the majestic mountain from up close. Be aware that Mt. Fuji’s 5th Station is 2,305m above sea level and thus on average 10~15 degrees colder than the ground level: remember to wear or bring additional layers of clothing! Lunch is based on seafood, and it’s held at the Numazu Gourmet Road Roadside Station: during the 1-hour buffet BBQ, you can choose your favorite seafood from an ample selection (including shrimps, turban shells, scallops and much more) and cook it right away on the grill at your own table. After lunch, the tour heads to one of the most impressive scenic spots of the area, the Mishima SKYWALK, on which you can leisurely stroll for about 50 minutes. Japan’s longest suspension bridge connects Izu and Hakone and offers a great view of not only Mt. Fuji, but also the Izu mountains and Suruga Bay. Hop on the bus to head to your following destination, the Hakone Tozan Railway. Depending on when you book this tour, you might be leaving from Gora Station or Chōkoku-no-Mori Station (for departures between June 2nd- July 8th). 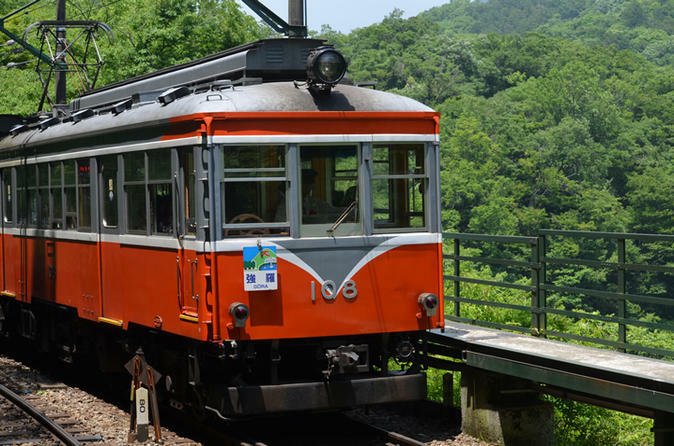 The Hakone Tozan line is Japan’s oldest mountain railway and has been active since 1919. The trains climb from 96m above sea level to 541m above sea level in the span of 7 stops, a climb made possible by careful planning and a system of switchbacks, in which drivers exchange positions and the train switches to a reversed travel direction. The railway crosses the Fuji-Hakone-Izu National Park and the ride is guaranteed to offer a glimpse of its amazing landscapes. In addition, departures between June 3rd and July 8th ride the Hakone Hydrangea Train, to take full advantage of the sight of blooming hydrangea flowers (blooming might be affected by weather conditions). Please be aware that you might have to stand or queue if the train is crowded. After the 40-minute train ride, climb off at Hakone Yumoto station and head back to the bus: arrival back in Shinjuku is expected at around 18:00pm.